In my last post I showed a easy way to get images from Image Capture into Evernote. While that worked great it had one problem: Image Captured tends to 'forget' the selected application and you need to go find it again. 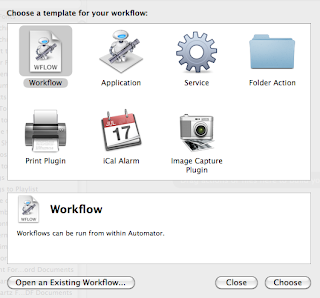 Setup is quite easy: Run Automator and select new 'Image Capture Plugin' . 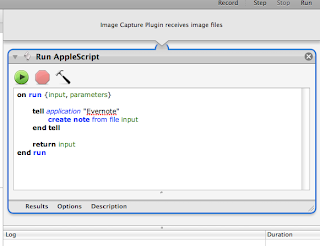 Then add a single item to the flow -- Run Applescript with the following applescript. Save it to to the default location and call it something like 'Evernote' and Voila, it shows up in Image capture as a first class citizen (and will never disappear). Note that this is for Snow Leopard (10.6) - I don't know how if or how this trick will work on earlier version of OS X.